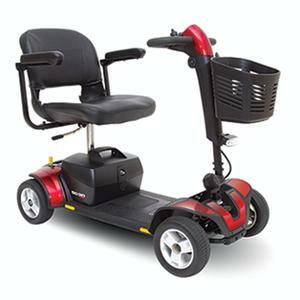 The Go-Go® Sport delivers high-performance operation and easy disassembly for convenience on the go. With a 325 lbs. 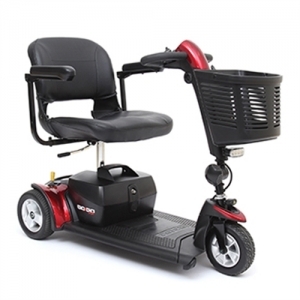 weight capacity, charger port in the tiller, and standard front LED lighting, the Go-Go Sport is feature rich and travel ready.With one-hand operation, Pride Mobility’s Go-Go Sport permits a simple frame separation. The Go-Go Sport can be disassembled into 5 ultra light pieces quickly. It comes with two sporty, interchangeable shroud panels in blue or red–you choose! Also standard are (2) 12V deep-cycle batteries that can be charged either on-board or off-board. Enjoy up to 9 miles on a single charge! The charging port is located on the tiller, making it a breeze to access.